Multilanguage support is used to enables or switch to any languages in the WordPress site. Up to WP Ultimate CSV importer PRO version 4.1 supports English language only. Other than English the three languages support added in WP Ultimate CSV importer PRO version 4.2. To enable the multiple languages first you need to download the multi-language support plugin and then activate it in the “plugins” that appears on the left side menu. By default the language settings contains only English option. To enable the Multilanguage support first you need to download the Multilanguage support plugin. After importing the plugin you can change the language using the following procedure. Then click “Save changes” to add the languages in the language menu. The enabled languages are added in the menu that appears on the left side. Click the languages to make changes. After enabling the languages you can change the languages in the following way. From the drop down menu you can the wordpress site language. 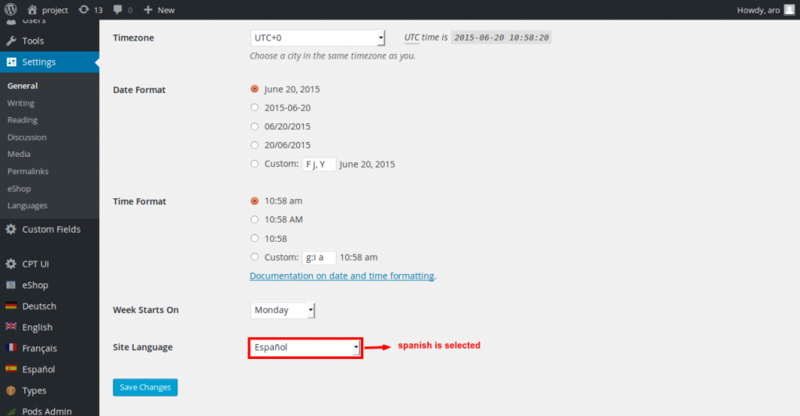 Then the WordPress site language will be changed according to your language selection. In the above screenshot you can see the language is changed on the WordPress site. This is how multi-lingual feature can be enabled for your WordPress preferred language. More languages are in the queue will be added based on the request, feel free to send your request to us to prioritize your preferred language.